“Turnabout Intruder” is the last episode of Star Trek, and what a dismal ending. Kirk meets yet another old flame from his academy days, Dr Janice Lester, part of an archaeological expedition on some planet that sends a distress call. Lester is ill, but as soon as she and Kirk are alone she activates an alien device that swaps her mind with that of Kirk’s. It turns out she is insane with envy of Kirk’s starship captain position, and resentment of the fact that (in her mind) it was because she is a woman that she could not succeed as well as Kirk. 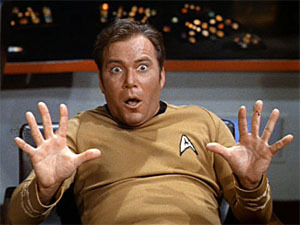 The rest of the episode is spent with William Shatner hamming it up as the mind of an insane woman in Kirk’s body. “Kirk” uses his authority to have “Lester” (with Kirk’s mind) safely sedated in sick bay, but “Lester” manages to talk to Spock and convinces him that it’s Kirk’s mind inside. Spock can’t convince anyone else though, and “Kirk” organises a court martial for mutiny. McCoy and Scotty don’t know what to make of the situation, though the fact that “Kirk” is suddenly clearly bug-nuts insane in between filing his nails should ring some bells. And all the time there’s this rippling 1960s-style sexist undercurrent that Lester lost it because she could never be as powerful as a man, and couldn’t accept that like other women. It seems like in the Star Trek universe women can have positions of power, but Lester seems to blame her own incompetence on the “fact” that they can’t – so it’s a rather mixed message here. There could have been a dramatic ending, but it’s deus ex machinaed away by the expedient of Lester going even more insane and losing her grip on Kirk’s body, so the mind swap simply wears off. It’s a lame ending to an uncomfortable story, about the only redeeming feature of which (by which I mean so-bad-it’s-funny) is Shatner’s positively loopy over-acting. Well, it’s been a long ride through all the episodes, and what a downer to end on, but there were definite highlights along the way. I’m not sure if I’ll continue with any more of these sort of reviews. I might have a few months off and then see what I feel like watching. Tropes: Grand Theft Me, Driven By Envy, I Just Want To Be You, Female Misogynist, Large Ham, Evil Is Hammy, Kangaroo Court, Anti-Mutiny, Axe Crazy, Different For Girls, Values Dissonance, Stay In The Kitchen, Deus Ex Machina, Reset Button Ending. This entry was posted on Thursday, 1 December, 2011 at 22:13	and is filed under Star Trek. You can follow any responses to this entry through the RSS 2.0 feed. You can skip to the end and leave a response. Pinging is currently not allowed. What sort of thing might you move on to? Something you’re very familiar with but haven’t been following recently? Something you’ve never seen before? I take it moving on to the behemoth of the Next Generation is not something you really have in mind. I’m thinking of doing the original cast movies (i.e. Star Trek 1 through 6), but I need a break first.